What will the U.S. look like a century from now? Rob Lang, Mariela Alfonzo, and Casey Dawkins offer some thoughts. Deborah and Frank Popper celebrate a post-racial nation. Cities in 2050? David Dixon takes a shot at the future. John McCarron says it's the process, not the plan, that needs an overhaul. Climb aboard for Ruth Knack's interviews with transportation gurus. In Planning Practice. An excerpt from a new Planners Press book by Emily Talen. A bimonthly column by Paul Farmer, FAICP, APA's Executive Director and CEO. Renewable energy, Florida agency under the gun. Buddha statue, EPA endangerment finding. A monthly column on stats in the news — compiled by APA's Research Department. This month: demographics. Reid Ewing reviews Eric Dumbaugh's Journal of the American Planning Association articles about traffic safety and urban design. The inaugural, planting with care. New reports, videos, blogs, etc. 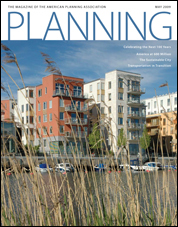 Cover: Waterfront flats at Hammarby Sjostad, Stockholm. Photo by Timothy Beatley.